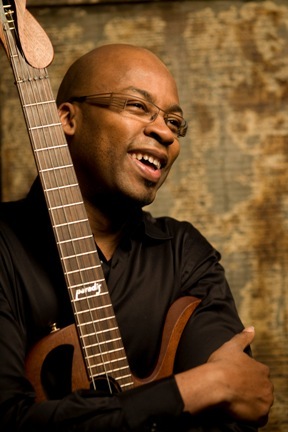 Guitarist and vocalist Lionel Loueke’s meteoric rise continues with his performance Sunday May 22nd at the acclaimed Douglas Beach House in Half Moon Bay. Currently celebrating his sophomore release for Blue Note, Mwaliko, which features a series of searching, innovative, intimate duets with Angelique Kidjo, Esperanza Spalding, Richard Bona and Marcus Gilmore, Loueke has been praised as one of the most striking jazz artists to emerge in some time. With his long standing group featuring Massimo Biolcati on bass and Ferenc Nemeth on drums Loueke draws both from traditional African sources and such Jazz influences as Jim Hall and George Benson. Considered “a musical painter” by his mentor Herbie Hancock, Loueke’s blend of creative guitar techinque, sophisticated harmonies, and African influenced rhythms have lead to an inviting and poignant sound all his own. In addition to leading his own band Loueke has also toured the world in the bands of Herbie Hancock and Terence Blanchard appearing on Terence Blanchard’s Grammy-nominated Flow (2005) and Hancock’s Grammy-winning River: The Joni Letters (2008), as well as performing on recordings by such fellow rising stars as trumpeter Avishai Cohen, drummers Francisco Mela and Kendrick Scott, vocalist Gretchen Parlato and more. Enjoy the splendor of Lionel Loueke’s Trio Sunday May 22nd as they perform songs from his highly acclaimed Blue Note debut Karibu, and his current recording Mwaliko, in the picturesque atmosphere of the Doulas Beach House, Half Moon Bay’s premier Jazz spot, just 40 minutes from San Francisco and Silicon Valley. Doors open at 3 pm to enjoy the buffet and 180 degree oceanfront views. Two one-hour sets with intermission begin at 4:30. Admission $35.